Imagine relaxing in the 16 squares in this little piece of luxurious heaven with the entire 1st floor to yourself. THEBEACH at Moggs Creek just past Fairhaven on the Great Ocean Road is exquisitely and stylishly decorated with an eclectic flair to create a comfortable, casual elegance. The one kingsize bedroom comes with a huge kingsize bed, an ensuite with double massage spa overlooking the waves breaking on the beach, a separate shower, heated towel rails and adjoining enormous private dressing room. 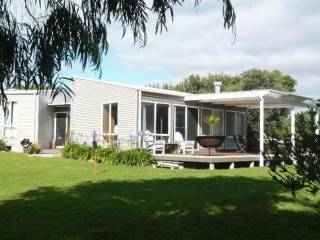 This $M property has $M views from every window of the generous light filled lounge room with picture windows and double opening doors onto decks either side The living room has twin leather sofas for watching the views and wide screen LCD TV. From the 4 private decks, including 2 sundecks, outdoor furniture and electric BBQ, resident King Parrots will eat from your hand. Sunfilled gallery, breakfast room for two and Butlers Pantry/kitchenette to meet your cooking needs. THEBEACH is climate controlled with ducted central heating and cooling throughout and there are no communal areas. We try to think of everything you might need to help you enjoy your stay and feel a bit pampered. Fresh milk full and light instant, plunger and ground coffee for the espresso machine plus a selection of Twinings and Herbal teas, shortbreads, bed time chocolates, tissues, toiletries and hairdryer are provided for your convenience. Free WiFi, Smart TV connected to internet for Netflix users. The breakfast room houses books, magazines, DVDs and CDs for in house use. You really only need to bring your clothes. STARTERS - 2 juices, 2 cereals. Eggs, bacon, sausages, mushrooms & tomatoes on toast Big breakfast. Pancakes with buttermilk icecream and maple syrup. Omelettes Your choice of fillings - cheese, mushroom, ham. tomato, spring onions. Poached eggs Hawaiian with ham, pineapple & mini tomatoes on toast. Hamburger and BLT with an egg too if you want. AFTERS - A selection of gourmet breads for toasting, jams and spreads are available on request and tea or coffee complete your feast. Espresso machine for coffee or instant or plunger if you prefer A dozen varieties of Twinings and herbal teas for the tea lovers. The only thing nicer than waking up to watch waves crashing onto a golden beach is - lying in the spa watching the sunset, sipping champagne on the deck watching the hang gliders in the sky, strolling hand in hand along a deserted beach, counting how many bites the fishermen get, following ships out at sea, seeing a penguin on the beach, spotting a whale...or a seal .......being ....alone together . THEBEACH is ADULTS ONLY and a CHILD FREE zone - exclusively for one couple. Number of guests cannot exceed the number stated on the Confirmation Notice. Maximum 2 adults - no children, no pets, no visitors. MOGGS CREEK is a small, sparsley populated hamlet on the Great Ocean Road, surrounded by Angahook Forest Park with loads of walking tracks and BBQ facilities, about one and a half hours from Melbourne and 2 hours to the 12 Apostles. 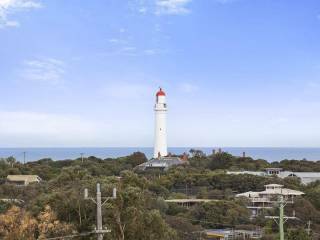 Situated half way between Melbourne 1.5 hrs and the 12 Apostles 2 hrs, Fairhaven and Eastern View on the Great Ocean Road , a short 15 minute drive either way, will take you to the shops, tourist attractions, waterfalls, rivers, pier, restaurants, beaches & paddle boats of Lorne or Anglesea. 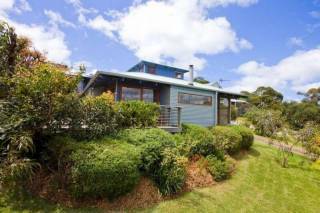 Local shopping with quality restaurant, bakery ,cafes, takeaways and pharmacy in Aireys Inlet, 5 minutes away. Moggs is probably best known for it's 8kms of beautiful pristine beach, with a parking area so small, it can never be crowded. Ideal for surfing, taking a dip, walking or jogging.The beach and surrounding shore line are popular with the patient fishermen, and when they're biting - word spreads quickly. Fairhaven, Spouts Creek 500m Urquarts Bluff and Hutt Gully are popular surfing spots in close proximity. Fairhaven is a patrolled beach during summer months.The hang gliders that serenely hover overhead are fascinating, and intriguing to watch land on the beach. Ships can be seen passing by and even a whale or two.Horse riding on the beach or bush tracks, and bicycles for hire and canoeing are available at Aireys with kayaking and surf lessons available at local beaches.The Great Ocean Road Archway is approximately 1km one way and the well known pole house 1km the other. 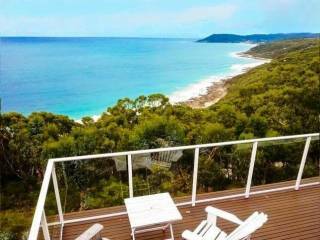 THEBEACH at Moggs Creek will appeal to those that want a spectacular base for day tripping, maybe a special stay on the way to somewhere else or just seclusion, uncrowded beaches and a place to relax, and be spoilt for holidays. WEEKENDS. Any 2 night reservation for Sat/Sun will be at the same rate as the Fri/Sat tariff shown below. PLEASE NOTE: For your added security, this property is owner operated and to avoid errors out of our control we do not accept payment through any online booking system - payment is direct to us by Visa or MasterCard only. We never request payments be made to Australian or overseas bank accounts.